2016 has been a truly historic year for the Royal Family. After Her Majesty, the Queen celebrated her 90th birthday, the first ever British monarch to reach such a landmark, her husband of almost 69 years, His Royal Highness Prince Philip, turned 95. To celebrate these historic Royal milestones, a brand new limited edition Third Guinea issue has been released. 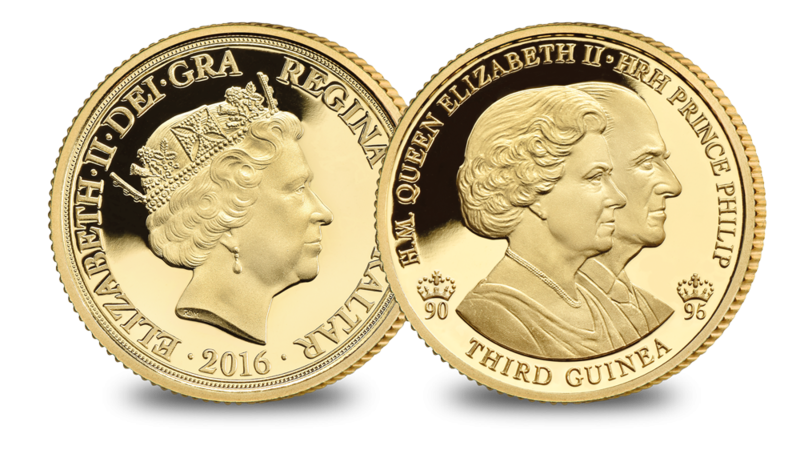 Struck in solid 22 carat Gold to the highest possible quality proof finish, it features two exceptional designs, specially chosen to pay tribute to our Queen and her Consort, in one magnificent coin. This is the first time a Royal Birthday has been commemorated on a Third Guinea and the first time a Third Guinea has ever featured a conjoined portrait. The Double Royal Birthday Third Guinea is struck in solid 22 carat Gold, the traditional purity reserved for British Gold Guineas since the coin was first introduced by King Charles II in 1663. Minted to mark the 90th and 95th birthdays of Queen Elizabeth II and Prince Philip respectively, this beautiful Third Guinea coin struck in proof condition, is a unique `one year type’. The stunning reverse design features Maklouf ‘s new conjoined portrait of the Queen and Prince Philip, which fittingly takes its inspiration from the William and Mary `double portrait’ Guinea of the late 17th Century. A `90’ and a `95’ emblem topped by crowns are positioned on opposite sides of the conjoined portraits. This beautiful Third Guinea coin is a unique ‘one year type’ with an edition limit of just 2,016 worldwide. Minted to the highest possible quality proof finish, the ‘one year type’ status and extremely low mintage ensure that it will be highly sought-after by both new and experienced collectors of gold coins. Don’t miss your chance to own the first-ever Third Guinea struck to mark a double Royal Birthday and the first to feature a conjoined portrait of Her Majesty The Queen and HRH Prince Philip. Supplied in a luxurious wooden presentation case with a Certificate of Authenticity.